Phalanx is a point-defense, total-weapon system consisting of two 20mm gun mounts that provide a terminal defense against incoming air targets. CIWS, without assistance from other shipboard systems, will automatically engage incoming anti-ship missiles and high-speed, low-level aircraft that have penetrated the ship primary defense envelope. As a unitized system, CIWS automatically performs search, detecting, tracking, threat evaluation, firing, and kill assessments of targets while providing for manual override. Each gun mount houses a fire control assembly and a gun subsystem. The fire control assembly is composed of a search radar for surveillance and detection of hostile targets and a track radar for aiming the gun while tracking a target. The unique closed-loop fire control system that tracks both the incoming target and the stream of outgoing projectiles gives CIWS the capability to correct its aim to hit fast-moving targets, including ASMs. The intent is to destroy the warhead on incoming missile. As a secondary measure, should it fail to hit the warhead, CIWS's rate of fire is intended to blow holes in the missile body, causing it to break up in air. 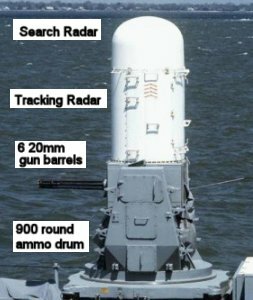 As a defensive weapon, the Close In Weapons System (CIWS) has special significance for Navy ships and their crews. Battle tested by the British during the Falkand War in the early 1980's, CIWS proved remarkably effective. Navy ship crews routinely test and operate CIWS to ensure the system is working correctly. While most testing involves tracking and firing at a simulated target, the real excitement starts when the fire control teams can fire at a real target. CIWS has been a mainstay self defense system aboard nearly every class of ship since the late 70's. It was originally designed to defeat low altitude antiship cruise missiles (ASCMs). As antiship cruise missiles became more complex in maneuvers and ability to be detected, and warfare areas moved from open ocean to littoral environments, CIWS has evolved to meet the threat. Block 0 incorporated on-mount search and track radars, the M61A1 gatling gun capable of firing at a rate of 3,000 rounds per minute, and a 980-round magazine. Block 1 incorporated a new search antenna to detect high altitude missiles, improved search sensitivity, increased the ammunition available for firing by 50 percent, a pneumatic gun drive which increased the firing rate to 4500 rounds per minute, and started using tungsten ammunition in place of depleted uranium. Block I improvements provide increased elevation coverage, larger magazine space for increased round capacity, a variable and higher gun fire rate, and improved radar and processing capabilities. Block 1 baseline 0 upgrades included a larger magazine (1,500 rounds), a multiple pulse repetition frequency search radar, an expanded radar search envelope to counter diving targets as well as reliability and maintainability improvements. Block 1 baseline 1 replaced the hydraulic gun drive with a pneumatic (air-driven) gun drive system that increased the rate of fire to 4,500 rounds per minute. Search radar sensitivity was also improved in the baseline 1 upgrade. Block I baseline 2 introduced further reliability upgrades and a muzzle restraint to decrease dispersion. Installed on multiple non-Aegis and Aegis ships, neither the original Phalanx Block 0 nor the subsequent Block 1 baseline 0, 1, or 2 upgrades are integrated with a ship self-defense system. A January 1992 Chief of Naval Operations decision requires replacement of Phalanx with the new ESSM system in new construction DDG ships. Though it initially appeared that DDG-79 would be the first new construction DDG to receive Evolved Sea Sparrow Missile in lieu of Phalanx, it now appears that, due to a slippage in the ESSM development program, DDG-85 will be the first. The Navy plans to install the Phalanx Block 1 baseline 2 configuration as temporary installations on DDG-79 through 84 until ESSM is produced. Block 1A incorporated a new High Order Language Computer (HOLC) to provide more processing power over the obsolete general purpose digital computer, improved fire control algorithms to counter maneuvering targets, search multiple weapons coordination to better manage engagements, and an end-to-end testing function to better determine system functionality. Block 1A provides for basic integration with the Ship Self Defense System and enables RAM missile engagement through the Phalanx detection and track function. As of mid-March 2000, Block 1A installations had been completed on 20 DDG (Aegis) destroyers, 2 LHD, 2 FFG-7, and 9 LSD 41/49 class ships. In addition, LHD-7 (currently under construction) will commission with Block 1A. Block 1B Phalanx Surface Mode (PSUM) upgrade allows engagement of small, high-speed, maneuvering surface craft and low, slow-moving aircraft, and hovering helicopters. This upgrade incorporates a thermal imager, an automatic acquisition video tracker, and a stabilization system for the imager, providing both day and night detection of threats. The thermal imager improves the system's ability to engage anti-ship cruise missiles by providing more accurate angle tracking information to the fire control computer. Additionally, the FLIR assists the radar in engaging some ASCM's bringing a greater chance of ship survivability. The thermal imager Automatic Acquisition Video Tracker (AAVT) and stablilization system provide surface mode and electro-optic (EO) angle track. Operational evaluation of Block 1B, conducted aboard USS Underwood (FFG-36) and the Self-Defense Test Ship, was completed in August 1999. According to Phalanx Program Office plans, Block 1B will be installed in 11 other FFG-7 CORT ships between June 2000 and July 2002.